Shrove Tuesday is traditionally a time to use up the last of our winter stores (which making pancakes fulfils rather nicely) before embarking on a spring fast for Lent. A lot of religious practices have practical implications, and this is no exception. You may remember me writing a couple of months ago that January is not always an ideal time to detox – we were in semi-hibernation mode, which is all about storing, holding on, and curling up by the fire. The time to start running about and releasing the toxins that have built up over the winter is spring, when the whole of nature starts to unfurl and raise itself up from the blanket of winter. Thespring equinox on March 21st marks that change in energy, and that’s what the traditional Lent fast – whether we give up everything or just the chocolate and stodge – is so good at preparing us for and seeing us through. As we yawn and stretch out way into springtime, our bodies start to open up on very deep level, at the level of our cells – where we hold toxins, excess sodium and calcium, and unresolved emotions and memories – and we go into a natural detox to throw off the accumulations of winter. This can be quite overwhelming, as our lymph, blood, liver and consciousness are hit with this sudden onslaught, and a fast around this time would help clear a way and create a space for all of this to come out and wipe the slate clean, so we can happily run about and be active in the livelier, warmer months. Fasting comes with a caveat though, be it a juice fast, a rice fast, or whatever level you take it to. We’re not the same creatures we were a few hundred years ago. Our world is more chemical and we have more to offload. We don’t seem to be that good at letting go of things, either, and instead, push things deeper into our cells, or bury things in protective layers of fat. Some of us may need a lot of fat to quarantine all our toxicity in. Some of us may dump toxins, including excess sodium and calcium, into non-life threatening places such as joints (which then become achy and inflamed) or as kidney and gallstones. Sometimes the load gets pushed onto skin, lungs or reproductive organs. Eventually it may move deeper and manifest as more life-threatening conditions. This is all going to need a helping hand to come out, and some special support for whichever organs are most strained. We can also no longer rely on our climate to match the seasons we’re in. If we’re still quite cold in March, then however much our cells open up and release, our lymph and blood will be too thick and sluggish to cope with it. In actual fact, average core body temperatures have dropped so significantly over the years that many people are permanently in that winter mode of contracting, slowing and holding on. So a fast or modern-style detox regime may be all too much for us. Overwhelming the lymph, blood and liver can lead to headaches, rashes, irritability, craving, lethargy, bloating and more. In this time where our bodies are going into detox, whether we like it or not, what we most need is a programme that helps to support our routes of elimination, as everything released from our cells tries to find a way out. This programme will be individual to you, as we are all different, and one man’s meat is another man’s poison. So that detox in a box, or book, or magazine, may need to be adapted to suit you. To really surf that equinox wave, get a tailor-made programme from a natural nutritionist or naturopath who takes the time to understand where you’re at, and can help you get to where you want to be. Breakfast: Detoxing can play havoc with our blood sugar levels. To avoid blood sugar related headaches, dizziness, nausea, cravings, irritability, lack of energy and dehydration, we need regular protein, alongside a good balance of oils. This is particularly important at breakfast, so start the day with something like fish, eggs, soaked nuts and seeds, or a good, hearty soup. Quinoa porridge is also great, quinoa being a “complete” protein containing all the essential amino acids (see www.naturalrecipes.co.uk for recipe). 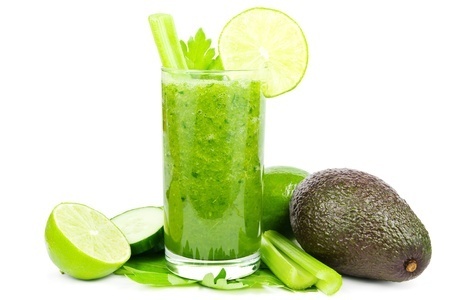 Green Juicing: Juicing green vegetables is fantastic, as these help clear and revitalise our weary, overloaded livers. Green juices also provide a fantastic array of nutrients, including potassium and magnesium, which help push toxins out of the cells and maintain hydration throughout the body. Fruit juices: Fruit juices and smoothies are tasty and nutritious, and will give you that sugar buzz you may be craving after giving up your chocolate – but may also give you that sugar crash, leading to those blood sugar problems listed earlier and a loss of all that beneficial magnesium and potassium. Eating seasonally and organic: This will put less strain on the body’s digestion process and so is especially important when trying to clear and refresh the body. Raw vs. cooked: If the weather’s still cold, then a 100% salad or raw food diet may not be ideal either. Start meals with something raw for their amazing enzyme value – sprouted seeds and pulses are great for this – but make sure you still include warming and cooked foods if the weather dictates or if your digestion is weak. Go veggie? : Some people thrive on a balanced diet of grains, pulses and vegetables, and if that’s you, then go for it. Others will feel terrible on the same diet and it won’t be conducive to health and vitality at all. Blood group theory points to the Os as being more inclined to need some animal protein in their diets and less able to deal with grains, but this seems to be true of some As and Bs as well. Gluten-free: There’s a lot of undiagnosed gluten sensitivity out there, so wholemeal pasta, cous cous and rye bread may not be the way forward. Instead, try quinoa, millet, rice, polenta and buckwheat pancakes, If you’re not sure, see a good nutritionist for specialist advice. Naturopathic techniques: A programme of techniques, such as skin brushing, packing and enemas, will help clear and support the organs of limination that may be struggling. A natural nutritionist or naturopath will be able to suggest what’s right for you.